Finally! I got the pictures from the official photographer and I can at last tell you everything about our Chinese wedding, which was on May 13th. 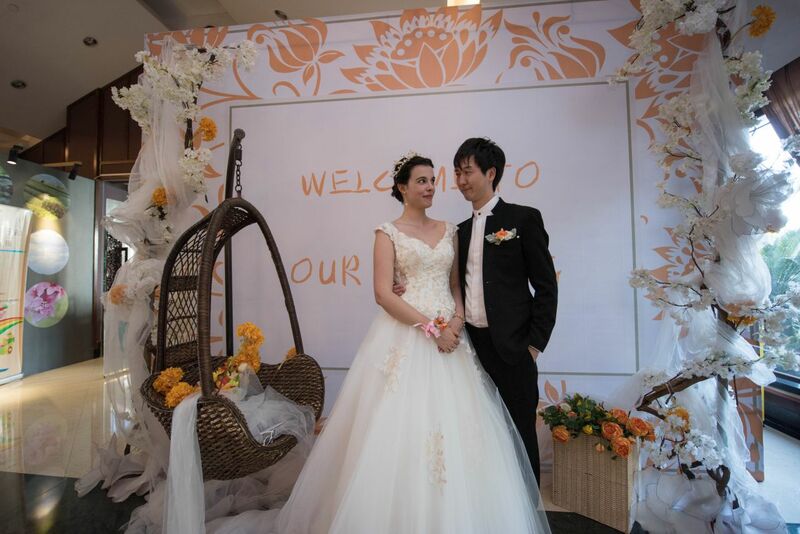 Well, as you will see, our wedding was not a traditional Chinese wedding at all, because we are not traditional. We tried to have a wedding that we would be happy and comfortable with, and I can say we succeeded. 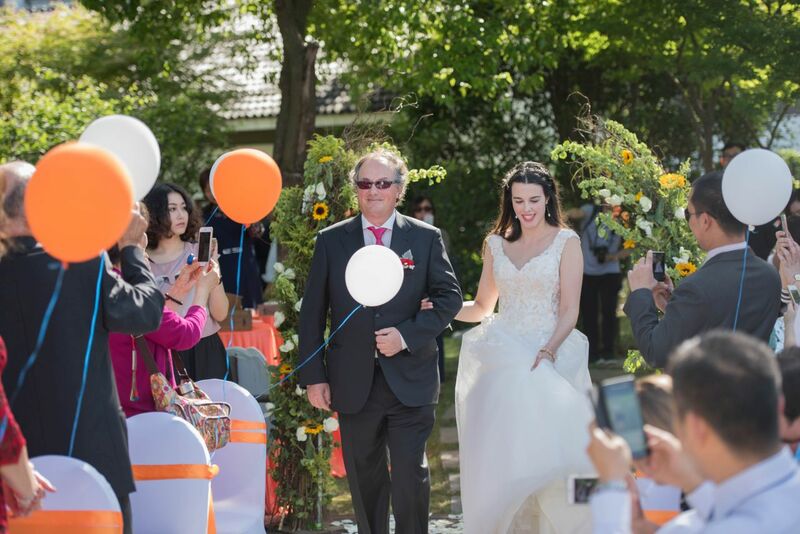 We were very glad that neither my parents nor C.’s parents meddled with the wedding organisation… in fact, they did not to try to do anything at all! 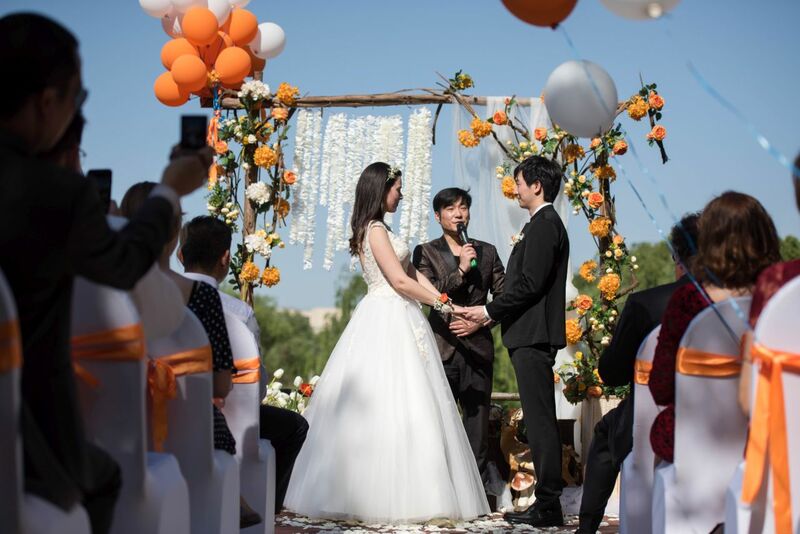 I was very relieved, as I know that usually Chinese mothers in law insist in arranging everything and you basically attend your own wedding without knowing how it is going to be. I have attended many weddings in China so I know a fair bit about them. 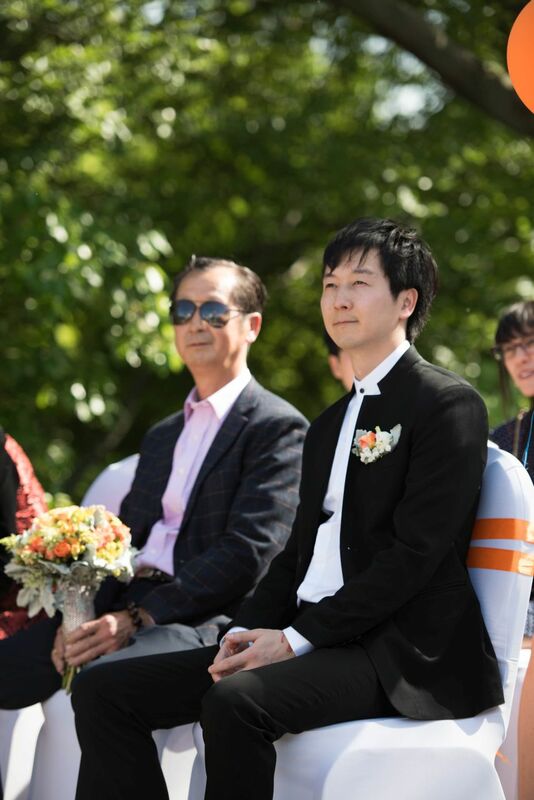 Because I know how they normally are, there were several things I wanted to make sure for my own wedding: 1) it would be an outdoor wedding; and 2) there would not be an MC. Outdoors because I don’t like the usual banquet hall were the windows are covered (I think they are ugly and they even give me a bit of claustrophobia) and no MC because they are very noisy and annoying (MCs in Chinese weddings “entertain” guests during the whole dinner, telling stories on the mic, singing, even doing games). 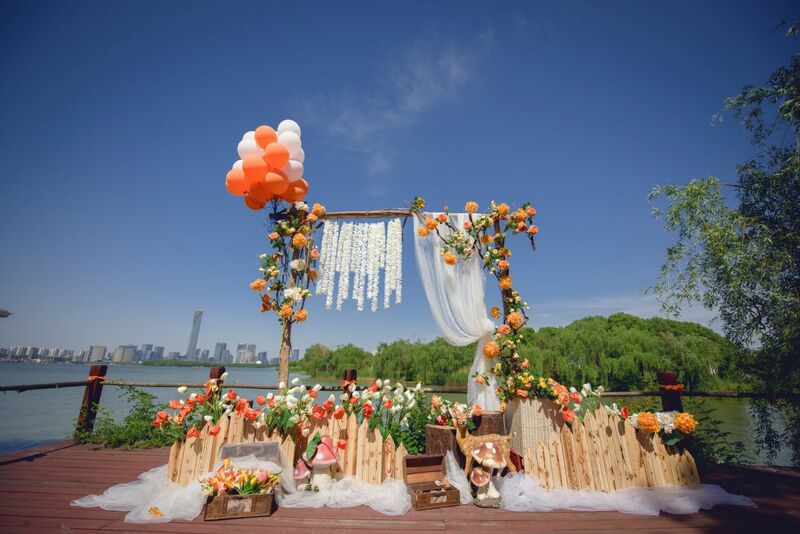 There are not many places which arrange outdoors weddings in Suzhou. Some hotels have gardens where you can have the ceremony, but the dinner still has to be inside (in a windowless hall! Argh!!). However, we were very lucky to find a beautiful little hotel where both the ceremony and the banquet could be done outside, and we quickly booked it. Besides, this hotel had other two advantages: it is pretty small, so we would have a limited number of guests (Chinese weddings are usually a huge affair, with many guests that you have never seen in your life), and its restaurant serves Thai food, which ensured that our wedding menu would be different to your typical wedding. 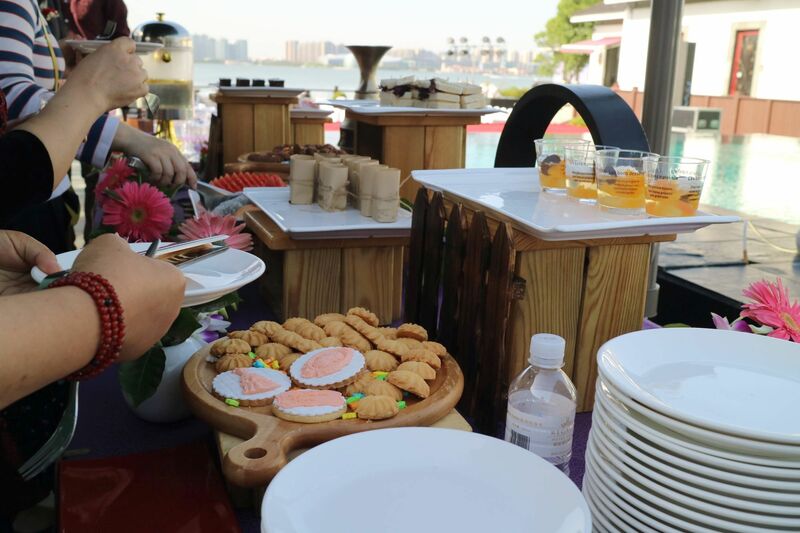 In Suzhou, when I attend a wedding, I know beforehand what I am going to eat because the menu is ALWAYS the same. Booooring! After we booked the hotel, we also hired the wedding planners they normally work with. The wedding planners then arranged the decorations, the photographer, my make up, the lights, the DJ, the stage, the “priest”… C. did all the communication with them and the only thing I had to do was choose the colour theme and my bouquet. 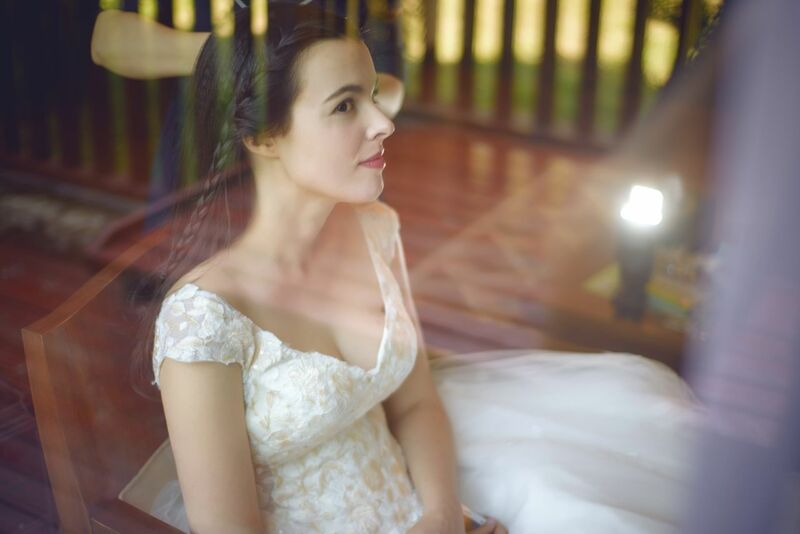 I was a very relaxed bride, haha. C. had to work a bit more, as he had to find a band, make the seating plan, buy the alcohol and cigarettes… Well, we both had to work (it was literally manual work) assembling our gift for the guests: a small red wooden box which contained Ferrero Rocher inside. We had to assemble over 800 boxes, as C. had to give gifts to everybody in his company! But C.’s parents helped us with this and in fact did most of the boxes. I’m so glad I had time to eat! During the previous months I was not really sure how the food was going to be. We had decided to have a buffet, and I was a bit scared food would not be too good, or enough, or that people would make a mess in the buffet area. But the hotel did a fantastic job. The food was amazing and more than enough. We had many different dishes (including at least 5 or 6 vegetarian options) and there was fresh salmon sashimi being cut on the spot (which I actually don’t even remember ordering, hahaha). The Filipino cover band we hired played at the beginning of the banquet and after that the soundtrack was a playlist I had prepared beforehand. Believe it or not, but once I went to a wedding where the same song was played all the time during the banquet (is it just me or listening to the same song 300 times in a row is one of the most annoying things ever?). After the dinner, we went with a bunch of guests to the karaoke to finish the night. We were tired, but we sang a few hits! We love karaoke so it was the perfect ending. We were extremely lucky and we had a sunny, blue sky day (the previous day had been raining). 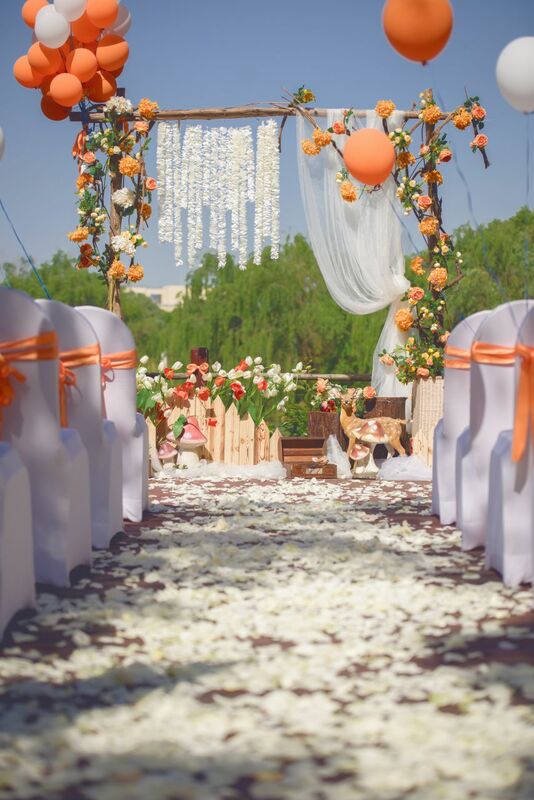 I absolutely loved the decorations in the ceremony and the background of the blue sky and the lake. Isn’t it beautiful?? I didn’t choose any of these, btw. I only said I wanted the colour theme to be orange, haha. My entrance with my dad. The afternoon tea. I don’t have pics of the dinner food! In the hotel lobby, about to start welcoming the guests that came for the banquet. Now it is my time to arrange and organise things, as our Spanish wedding will be in October. Weddings in Spain are more complicated I think, as they are longer. Let’s see how it goes! It was a wonderful wedding! The best chinese wedding I ever assisted 😉 The Spanish one is going to be amazing, sure! Congratulations! You look absolutely beautiful and for one moment I didn’t expect a traditional wedding from you guys! How’s the dress hunt going for the Spanish one?! The plan is using the same dress. I had a hard time finding one that I more or less liked as the styles in China are definitely different than in Spain! But in Spain wedding dresses are too expensive. I thought you might! I’ve only ever seen one bridal shop here on my travels and it was in the posh part! Absolutely beautiful! Kind of you to share your special day with us.. Excited to learn about your Spanish wedding and those traditions. Question, why did your husband have to give a gift to ALL employees? 800 gifts, that is a lot! Do all employees have to do this when they get married or maybe he is an owner. Did you take a picture with ALL 800 gifts? Smiling… I don’t think I have ever seen 800 gifts in one photo. 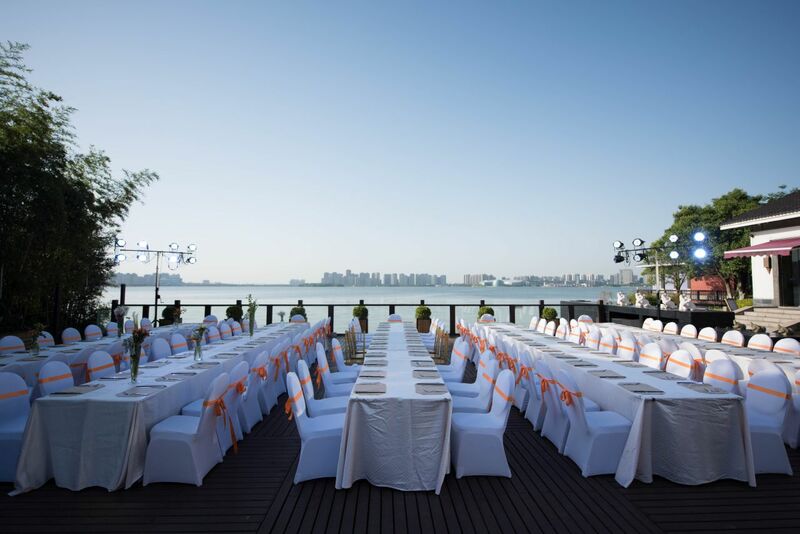 OH, you had a BEAUTIFUL setting by the water for your outdoor wedding! Great choice. CONGRATULATIONS! a good problem to have, I think! Congrats on your wedding. It looked much nicer, pleasant and interesting than regular Chinese banquet hall weddings, whether in Taiwan or China. I wish I could have Thai food at a wedding, ha. All the best for you and C.
Well, the food was not purely Thai, it was a bit mixed, but definitely different from the usual. Thanks! Yay for outdoor weddings! I think the pictures are definitely prettier if it’s outdoors. The only problem is that there might be mosquitoes! What a wonderful account of your special day Marta. You look beautiful. I love your dress too. Thanks so much for sharing. Thanks Sue! The dress was a bit uncomfortable but at least it looks nice in the pics I guess. It looked beautiful Marta. The price of looking gorgeous. Looking forward to your home wedding too. I’ve been waiting to see these photos. What a beautiful wedding! I hope you had fun. You looked really beautiful in both your dresses. The food sounds delicious. You made a lot of good choices. Muchas gracias, maja! No te creas que estoy yo muy convencida del pelo suelto, jajaja. Beautiful! Cannot wait to see your Spanish wedding! OMG. Your wedding posts are so educational. I’m sooooo glad you decided to be unique and not do the usual Chinese wedding. Ugh. It’s so weird how everyone wants to be the same in the ‘East’. Maybe they think they will “lose face” if they dare to do something different? No idea! Thanks a lot Lani! You’re gorgeous, and the white dress actually looks pretty good. I can’t wait to see how your Spanish wedding turns out! What a beautiful wedding!!! I recently posted about my wedding too. I definitely know what its like but being able to blend both cultures into your wedding was a wonderful idea. That’s exactly what we did too!! Congrats and thank you for sharing! Oh a Spanish wedding sounds so fun! Wonderful! You looked great and your FIL still cracks me up in every photo. Looks like your families get along well. Everyone seems to be having a great.time! Of course they get along, they cannot communicate at all, haha! Congrats, Marta! What a beautiful venue and the décor is just stunning. The both of you look so happy. I can’t wait to hear and see photos from your Spanish wedding. Thank you, Constance! Just a month left for the Spanish wedding! I am actually flying to Spain today to prepare everything! Thank you! 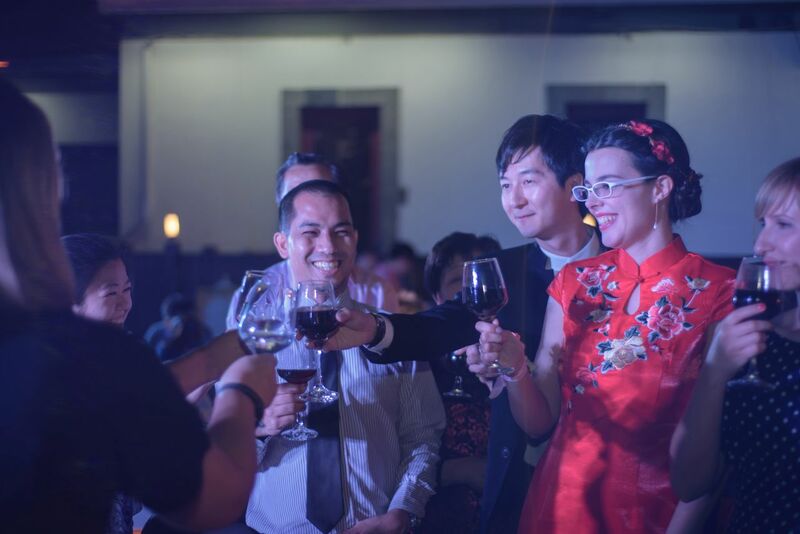 Our Chinese wedding was fine, but I had much more fun in the Spanish one, hehe. I’ll write about it soon!